Pick the right USB port requirements from either USB-HID, USB 2.0 High Speed – get maximum USB functionality with USB 2.0 up to 480 Mbit, or for secure locations just select USB-HID for keyboard mouse only. RS-232 for control signals up to 115.2 kBaud. Draco compact Extender CPU units for Cat-X cables –digital video for DVI-D, DVI-I (VGA), USB-HID, USB 2.0, analog audio, digital audio, and RS-232. Power supply is 90-240VAC, 5VDC, 3A. 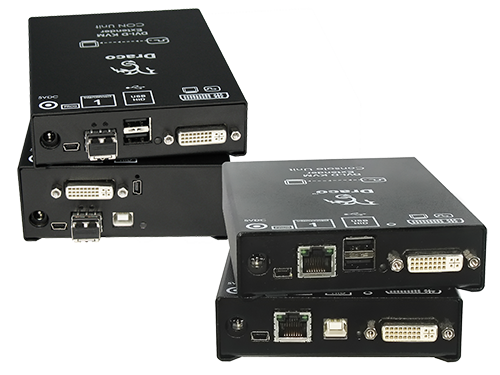 Draco compact Extender CPU units for fiber cables –digital video for DVI-D, DVI-I (VGA), USB-HID, USB 2.0, analog audio, digital audio, and RS-232. Power supply is 90-240VAC, 5VDC, 3A. Draco compact Extender CPU units for extreme velocity fiber –digital video for DVI-D, DVI-I (VGA), USB-HID, USB 2.0, analog audio, digital audio, and RS-232. Power supply is 90-240VAC, 5VDC, 3A. Draco compact Extender CON units for Cat-X cables –digital video for DVI-D, DVI-I (VGA), USB-HID, USB 2.0, analog audio, digital audio, and RS-232. Power supply is 90-240VAC, 5VDC, 3A. Draco compact Extender CON units for fiber cables –digital video for DVI-D, DVI-I (VGA), USB-HID, USB 2.0, analog audio, digital audio, and RS-232. Power supply is 90-240VAC, 5VDC, 3A.